Hey Duo could you add the pinyin underneath the translations when you transition out of beta? Without the tones learning along because not so effective. Thank you! Idk if Duo can do this, but Pleco Dictionary color codes characters by tone, e.g. 1st tone is red, 2nd tone is green, etc. I find this to be really helpful with learning pronunciation. 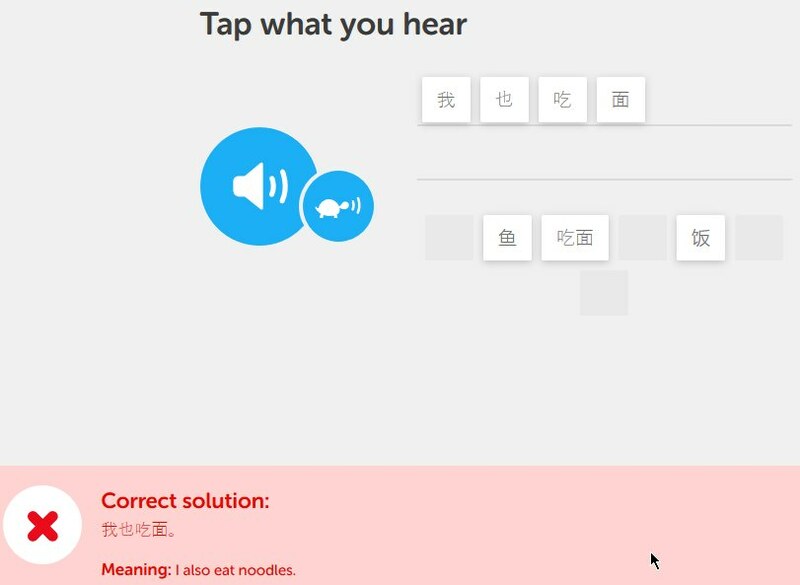 It would be great if the folks at Duolingo could do something like that. I agree wholeheartedly. I find that I am challenged to learn new words (character and pinyin) but have no idea what they mean. Google Translate gives the pinyin. I'm afraid it does mean it, especially in colloquial. Say e.g. you and your freind are placing the order in a restaurant. His choice is noodle, he said "我吃面I'll have noodles" and then turn to you and ask "你吃什么 how about you/what are you going to have/eat?" you could answer him with a delightful smile "我也吃面 I'll also have/eat noodles." Yeah, that's exactly what I was thinking. Im pretty sure its the same with rice as well. Did you tell them in their section? In English [I eat noodles too." " I also eat noodles." are ambiguous in the sense that both may either mean that I eat noodles as well as someone else does, or as well as I eat something else. Is the Chinese statement ambiguous in the same way? Thanks in advance for answering my question. I could be wrong (I am also learning), but since 也 directly follows 我, I think it can only mean that I as well as someone else eats. I think 也 would move if you wanted to say the other thing. Can you really say "I also eat noodles"? Am i being totally stupid? It's also used as a reply to say 'I will also eat noodles'. For example if your friend says '我吃面' (I will eat noodles), you can say '我也吃面'. i agree too! gives me another something to add to the memory process. How would you say "I eat noodles also" to indicate you eat noodles in addition to something else? 1: I eat noodles and bread. 2: I also eat noodles and bread. Something like that. Not an expert. It appears this is slightly broken; https://i.imgur.com/bJb8bNF.jpg I input the correct answer, but was told I was wrong. 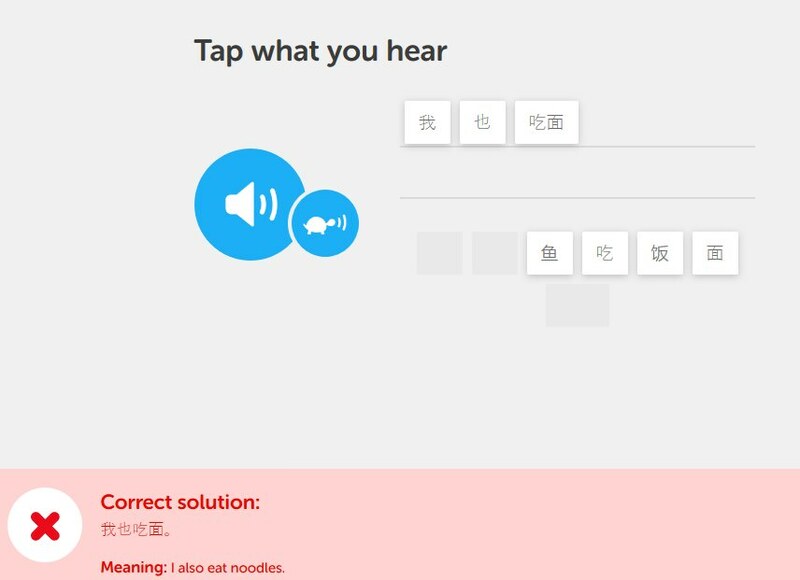 The sentence 我也... Change the third tone(down -up ) to a 2 (up) because 2 word with third tone are near , is right or i mistake ?